When combined with other enhancements, such as the ability to create specific view types, the whole workflow now allows you to optimise your presentation style, not only across a project or office, but across the whole firm. 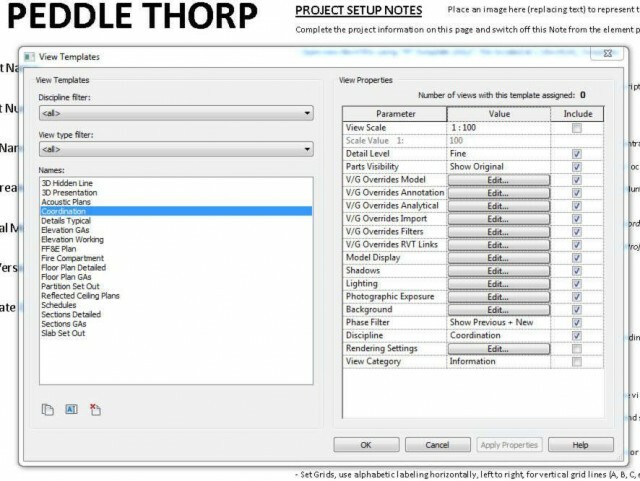 If you are thorough when building your Revit template(s), you can have all of your various view types predefined with specific View Templates already applied. Then every view created will automatically default to the correct settings. This can include everything from scale, parts, links, phases, disciplines, colour schemes, V/G overrides, and even custom view parameters, etc. The list really does go on and on. If you take the time to set up these view settings carefully, you can very tightly control the consistency of the appearance of all views in all projects! You just have to be careful to leave enough adjustment (by deselecting ‘include’ tick box) where users require it, for example ‘scale’ for most View Templates can be omitted. It will be a matter of trial and error finding the balance when you are first trying to impose strict use of View Templates. And yes, users will adjust views to suit their own needs (a little training goes a long way here), but at least this way you are providing a consistent starting point, and a simple way to correct any views to make them compliant with your firms presentation standards. Anything that provides this level of control and consistency most certainly leads to a betterRevit!